A discoloured tooth is any variation from the normal colour. A normal and healthy tooth can be various different shades of white or cream and the gum should sit tightly around it. The normal colour can vary depending on the shade, thickness and translucency of the enamel. There are several different reasons for teeth to discolour and these reasons may be due to factors affecting the tooth from the outside or inside. Outside factors are referred to as extrinsic and mainly affecting the enamel. Inside or instrinsic factors affect the sensitive dental pulp or can affect the development of the tooth in general. Trauma or chronic wear, infection or inflammation, metabolic disease, some developmental conditions and certain drugs can all causes changes to the teeth. If a tooth does not appear normal or changes in colour, it is important to have your pet’s mouth examined by the veterinarian to determine whether one or multiple teeth are affected. It is important to consider the pet’s age and stage of dental development and whether the dentition is deciduous, mixed or permanent. It is also important to note how long the tooth has been discoloured for. All these factors will help determine potential causes as well as treatment. Some conditions may need further testing, such as X-rays to help with the diagnosis. What are the different causes of tooth discolouration? Trauma – dogs can be quite persistent when chewing objects such as toys or bones. Some dogs get into a bad habit of chewing rocks or other very hard things. These can cause chips and fractures but can damage the tooth without breaking it. Accidents such as being hit by a car, or cats falling from a height, can also cause tooth trauma. Initially the pulp becomes inflamed and bleeds. This results in a pink colour to the tooth and is referred to as pulpitis. The pulpitis may resolve and the tooth can return to normal but more commonly the tooth changes to purple, tan, brown, black or any intermediate colour. It can be painful initially but the pain usually resolves with time. The tooth often can become infected with bacteria and this infection can spread throughout the body. Plaque – Just as with humans, animals can also suffer from plaque and calculi build up on teeth. Plaque formation is due to bacteria that naturally occur in the mouth that, together with the cells on the inside of the surface of the mouth which are replaced with new cells, create a film over the surface of the teeth. This film thickens and hardens with time. In very severe cases, it can cover the whole tooth. The bacteria present in plaque can penetrate below the gum line and start to affect the tooth root too. Calculi – Calculi is the hard yellowish brown substance that “grows” on teeth when the plaque is not properly removed from the teeth and starts calcifying and hardening over a period of time. Imagine the results of not brushing your own teeth for months on end. The harder and more irregular the surface becomes, the more plaque tends to build up leading to a vicious cycle of the dental health deteriorating. Foods and medications - some pigmented foods and certain medications can cause discolouration to teeth. Tetracyclines which is an antibiotic (which by the way is very rarely used these day any more) used in young dogs while the teeth are erupting cause a distinct yellow discolouration as they affect the formation of the enamel. Systemic infection and fever – In young dogs and cats, illness while teeth are erupting can cause defects in the enamel. As the enamel is the protective layer of the tooth, any defect makes the rest of the tooth more susceptible to infection and damage. In some dogs, a distinct line in the enamel may be noted and this usually correlates to the time of infection. Developmental conditions – amelogenesis imperfecta is a condition in which the enamel does not calcify enough and so is softer than it should be which may cause discolouration. Dentinogenesis imperfecta is a condition where the dentin does not develop properly and the structure and integrity of the tooth is compromised and once again may cause a change in colour of the affected teeth. The treatment for discoloured teeth will depend on the cause. Sometimes all that needs to be done is a “dental” by the vet which entails an ultrsasonic scaling and polishing of the teeth to remove the plaque and calculi build up. Unfortunately with dogs and cats, this needs to be done under general anaesthetic as we cannot ask them to sit still and keep their mouths open. Brushing teeth with special pet tooth paste and giving dental treats and chews can delay the buildup of calculi but unfortunately some pets are more prone to developing dental calculi and plaque than others. In some cases, if the root is exposed or infected it will need to be extracted. It is very important that if you do brush your pets’ teeth that you do not use human toothpaste but instead get a special veterinary toothpaste from your vet. If the tooth is traumatised, some cases may require root canal treatment. This is where the pulp is cleaned out, disinfected and then filled with a hard substance that sets. This is not suitable in all cases and is considered a specialist dental procedure. In most cases the veterinarian will advise extraction of the affected tooth or teeth. Defects in the enamel can be difficult to correct and manage. 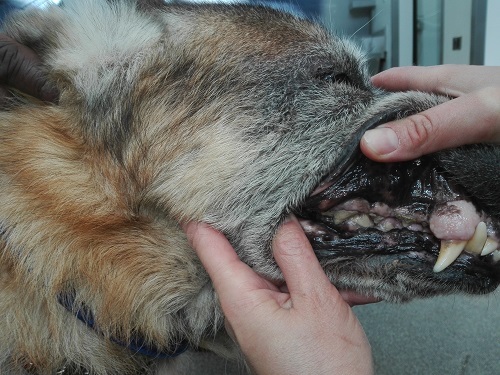 The vet should be equipped to deal with most of these conditions but may recommend that you seek a veterinary dental specialist’s advice for complicated cases. The veterinary dentist specialist may attempt to remove the affected enamel and apply a bonding agent but the success of this will depend on the extent of the lesions. Discoloured teeth in animals instead of a “bright and healthy set of pearlies” in most instances indicate that something is wrong with the animal’s teeth. Always ask the vet for advice and rather be pro-active and have it addressed properly than wait and in the end let the animal lose their teeth.